As a recap, I’m conducting an experiment on myself where I’m trying to change my sleep pattern from monophasic to biphasic. The difference between the two is simply that, for monophasic sleep, a person sleeps in one chunk, for biphasic sleep, sleep is broken up into multiple cycles. Today marks the third day into my adventure. Following from yesterday’s issues, today I returned to a monophasic schedule to recover. 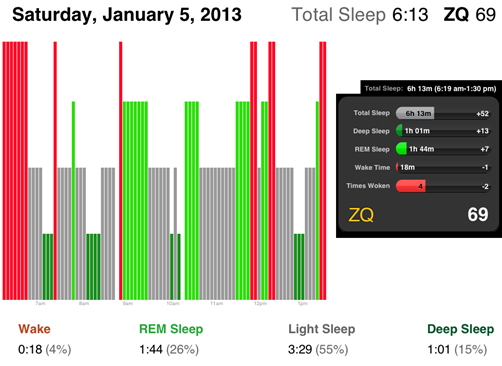 I’m not exactly sure about my REM cycle count for the day, which I think I should count as 5 cycles; however, I was impressed by the increase in deep sleep and slight reduction in light sleep. The wake periods are normal for day sleep (especially on a day that was almost 30 degrees), and from a total of 7hrs and 11mins in bed, I managed 6hrs and 13mins of sleep. 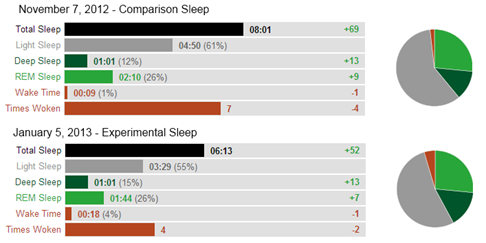 To put this into perspective against my comparison old monophasic sleep habits I’ve included my sleep breakdown for the day of 7 November 2012 in fig 2. The interesting difference appears to be that today in particular I had more interruptions than normal (which is normal given that November 7 was a Wednesday night, and January 5 is a weekend day sleep). Though my REM percentage and deep sleep percentage were better in my day sleep cycle and my light sleep percentage was reduced. I’m not sure if this is a positive sign that even after two days of biphasic sleep, my sleep clock is already adapting to a reduction in light sleep or whether this is simply my body playing catch-up to the sleep deprivation I suffered on Friday. With respect to my motivation to continue, my mental alertness and physical awareness.